Energy consumption and environmental impact are becoming increasingly important when a company invests in new material handling equipment. In other words, nowadays the impact on the environment caused by a material handler needs to be minimized. Additionally, the cost to handle one tonne of bulk material also has great importance, as this shows the economic feasibility. As a result, over the last few years, there has been a tendency towards greater energy efficiency. Several manufacturers now supply material handlers with hybrid systems, where the energy that is released during the boom down function is stored into accumulators. When the boom is lifted, the stored energy is utilized to support this movement. Usually an additional cylinder is required in combination with an energy storage system. Suppliers claim to save customers 30–35% on their energy bills. At the same time, more and more electrically powered machines are becoming available, instead of the traditional diesel powered material handlers. At E-Crane, they have been doing things quite differently for the last 25 years. Utilizing the principle of equilibrium, where the stick is connected to the rotating counterweight by means of a connecting rod, the load can be moved from point A to B at a fraction of the energy usually required. The energy savings accomplished using hybrid systems is insignificant in comparison. The philosophy is simple; start with an energy efficient design rather than adapting to a fundamentally inefficient one. On an E-Crane, the centre of gravity of the machine always stays within the slewing ring as the movement of counterweight and stick are synchronized. As a result of this, a balanced state is maintained and guaranteed at all times. When working with lighter loads, the movable counterweight moves the stick out almost spontaneously as it pulls the boom up. When working with heavier loads, the movable counterweight assures that smooth lifting is possible at low hydraulic working pressures. Additionally, electrically powered machines are nothing new for Belgium’s only manufacturer of bulk handling cranes. All machines are equipped with an electrical motor as the power source, and have been for many years. When no shore power is available, the machines can be equipped with a diesel generator set. Switching between shore power and diesel is always possible.What others see as an important innovation has been common practice for decades at E-Crane. This was clearly illustrated during the E-Crane Demo Days, which were held recently at the headquarters of the E-Crane Group of Companies to celebrate its 25th anniversary (please see ‘E-Crane celebrates 25th birthday with the launch of E-Handler’ on p58 of the July 2015 issue of Dry Cargo International). During this open house, an E-Handler® with a maximum outreach of 29 metres and a lifting capacity of 10.5 tonnes was shown and available for demonstration. It was impressive to see that this machine only required a 132kW electric motor to power it, while material handlers in the same range require a power source of around 350kW... start counting your energy savings! The E-Handler gives E-Crane a big advantage when entering the market of traditional material handlers. 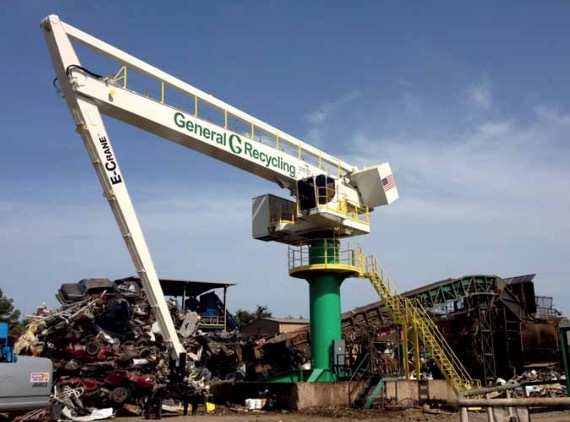 Where E-Crane was formerly known as a manufacturer of mostly large harbour cranes and as the marker leader of cranes for scrap catering inside steel mills, the company has now entered a segment where this equipment is within reach of a larger public. Consider recycling facilities where a shredder, shear or baler is fed. One E-Handler can do the job of three smaller material handlers at a fraction of the cost. The machine can comfortably cover an area of 2,700m2 and store material at heights of 15m or more. The E-Handler becomes one efficient unit together with, for instance a shredder, and can carry out all tasks involved: unloading trucks, storing material, feeding the shredder as well as loading the processed metals. In addition, the on-site safety is brought to a higher level, as there is a much reduced need for rolling equipment (material handlers, wheel loaders, etc...). Finally, the elevated position of the operator adds to the safety as he/she always has the best possible overview while working. While many claim to offer ‘green’ alternatives, E-Crane actually delivers. This is realized, considering a machine that can reach a life of 60,000 hours or more. The scope of supply starts at an outreach of 25 metres all the way up to 50 metres and lifting capacities of up to 60 tonnes are possible. Examples of these machines being used in Belgium include the Galloo Group, RETRA and Carinox in Chatelet. Examples of North American customers for these machines include American Reycling, Nucor, and Harsco Brazil.